Another example of AO’s hard work and dedication to design, even back in the 90’s. 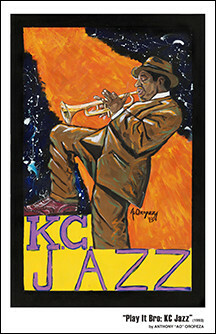 The painting was created for a KCK and Hallmark exhibit honoring Jazz, and was showcased in a KCK municipal building. The original is a 2’x3′ acrylic on canvas and shows the soul and passion of a trumpet player in the middle of something special – his love of making music. Considered one of AO’s best non-sports pieces, “Play It Bro: KC Jazz” is an excellent tribute to his home town and the music it produced back in the day. Order a Print and Pick Up at the Art Show – Save $5! AO and team can have your print ready for you at the art show! Order on-line, use the discunt code, save $5 dollars, and pick up at the show! Order your “Play It Bro: KC Jazz” print from the AOART5 Store Today! Order your own original today – Contact us with any questions.